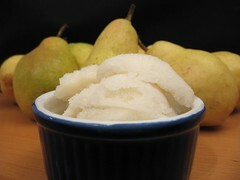 Pear sorbet - Do You Know The Muffin Man? Notes: Made with Bartlett pears. Smells unbelievably good while the pears are simmering in syrup. Texture is very creamy. For a double batch (about 1.5 quarts), I only used half a lemon, but it could use more (the recipe would call for two total).